Four studies demonstrate the vast opportunities provided by stacking pairs of monolayer materials and changing the resulting optical properties by twisting one material with respect to the other. Bernhard Urbaszek is at the Laboratory of Physics and Chemistry of Nano-Objects, INSA-CNRS-UPS, Toulouse University, Toulouse 31077, France. Ajit Srivastava is in the Department of Physics, Emory University, Atlanta, Georgia 30322, USA. Atomically thin materials are currently being investigated for fundamental research and applications in optics and electronics, because they interact strongly with light and have fascinating magnetic properties. When two different monolayer materials are brought into contact to form a bilayer, electrons can no longer move freely in the planes of the atomic layers. Instead, they are trapped in spatially periodic potential-energy variations called moiré potentials, as a result of interactions between the layers1. These nanometre-scale potentials are caused by the layers having different orientations or lattice constants — parameters that describe the dimensions of a unit cell in a crystal lattice. Moiré potentials have been predicted to strongly modify the optical properties of such bilayers2. Four papers in Nature3–6 report observations of optical emission and absorption that confirm this prediction. Monolayers of materials called transition-metal dichalcogenides (TMDs) have strong in-plane covalent bonds, and can therefore be produced by exfoliation (the removal of sheets from a bulk crystal) in a similar way to graphene — a single layer of carbon atoms. However, unlike graphene, atomically thin TMD crystals are semiconductors that have an energy gap between their higher-energy (conduction) and lower-energy (valence) electronic bands. Consequently, charge carriers in these materials that are excited by light or that are injected using a voltage can relax from the conduction band to the valence band by emitting particles of light (photons). Just as the weak attraction between layers lends itself to exfoliation, it also allows two monolayers of different TMDs (such as tungsten disulfide and molybdenum diselenide) to be stacked on top of each other to form what is known as an artificial heterobilayer (Fig. 1a). If the layers are periodic crystals that have slightly different lattice constants, the electronic properties of each layer are modified by the presence of the other layer. Specifically, the electronic states and band structure of the heterobilayer depend on the spacing and relative alignment of the atoms. Figure 1 | Features of moiré heterobilayers. a, Four papers3–6 report on the optical properties of moiré heterobilayers — stacks of two different monolayer materials that display a ‘moiré’ pattern. b, The teams studied heterobilayers in which light emission and absorption are governed by electrons and holes (electron vacancies) forming bound states called excitons. Tran et al.3 and Seyler et al.4 studied molybdenum diselenide–tungsten diselenide heterobilayers. Shown here are electronic-band diagrams for molybdenum diselenide (green) and tungsten diselenide (blue) that illustrate the higher-energy (conduction) and lower-energy (valence) bands. The two groups explored interlayer excitons, in which the electron and hole exist in different layers of the heterobilayer (indicated by the different colours of the charge carriers). Jin et al.5 focused on intralayer excitons, in which the electron and hole reside in the same layer. c, Alexeev et al.6 found that intralayer excitons can be mixed (hybridized) with interlayer excitons in heterobilayers of molybdenum diselenide and tungsten disulfide, the band diagram of which is shown in purple. The conduction band is delocalized over both layers, which permits the existence of a hybridized electron state (indicated by the arrow). Because of the slight mismatch in the lattice constants of the two layers, arrangements of atoms in the heterobilayer change periodically: atoms of metals (such as molybdenum and tungsten) are positioned on top of each other at certain points, whereas atoms of chalcogens (such as sulfur and selenium) are aligned at other points. These different configurations of atoms, known as registries, result in different energies for the valence and conduction bands, as verified by scanning tunnelling microscopy1. Consequently, electrons in the plane of the heterobilayer are subject to periodically changing bands, and, if the variations in the band energies are sufficiently large, electrons are trapped in moiré potentials. An attractive feature of such heterobilayers is the tunability of their periodic potential. Adding a slight twist during the stacking process, or exchanging one lattice with another that has a different lattice constant, leads to moiré potentials that have a different spatial periodicity. This feature enables the electronic properties of layered materials to be tailored in a fundamentally new way. 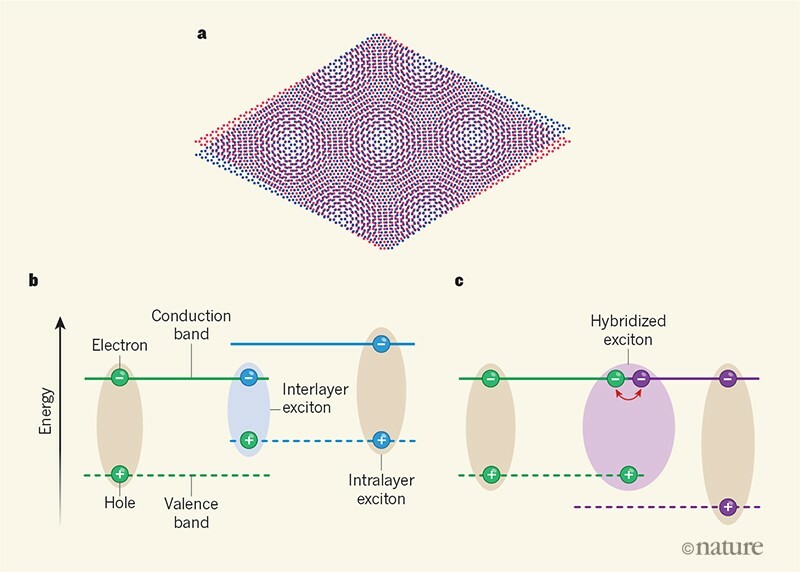 As a result, heterobilayers are becoming a playground for exploring exotic quantum phenomena — rather like how the strong interactions between electrons in twisted bilayers of graphene have led to the spectacular observation of superconductivity in electronic-transport studies7. The four current papers investigate the impact of moiré potentials on light emission and absorption in heterobilayers of TMDs. The work has many new aspects compared with studies on graphene–boron nitride heterobilayers1. First, the variation in the band energies for the different atomic registries is larger. Second, light emission3,4 and absorption5,6 in the TMD structures are governed by electrons and holes (electron vacancies) forming bound states called excitons8. And third, the excitons interact with light of a specific polarization that depends on the local symmetry of the atoms arranged periodically in the heterobilayer. Tran et al.3explored interlayer excitons, in which the electron and hole reside in different layers (Fig. 1b). 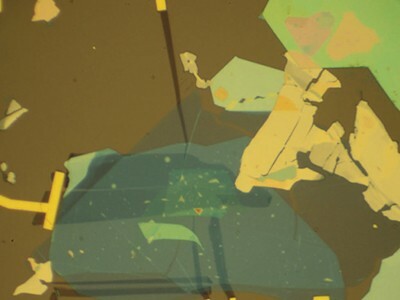 The authors obtained emission spectra from molybdenum diselenide–tungsten diselenide that had a small twist angle between the layers. They located peaks in the spectra that corresponded to interlayer excitons, and found that the energy separation between the peaks and the polarization of the emission depended on the twist angle. These results indicate that it might be possible to achieve nanoscale patterning of optical and magnetic properties in heterobilayers2,4. 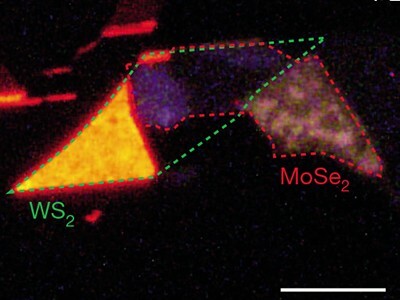 Seyler et al.4studied individual interlayer excitons trapped in moiré potentials, also in molybdenum diselenide–tungsten diselenide structures. They detected lines in emission spectra that corresponded to highly polarized light and that split into multiple peaks when magnetic fields were applied. These emission lines provide a fingerprint of the magnetic moment and valley — minimum or maximum of the band structure — of the electron and hole that formed a particular exciton. However, to verify that the emission really stems from a single exciton trapped in a specific moiré potential, measurements based on a phenomenon called photon antibunching will be necessary, to prove that, as expected, only one photon is emitted at a time9. Whereas Tran et al. and Seyler et al. focused on light emission, Jin et al.5detected experimental signatures of changes in light absorption caused by moiré potentials in tungsten diselenide–tungsten disulfide heterobilayers. The authors examined intralayer excitons10, in which the electron and hole exist in the same layer (Fig. 1b). They showed that the strong, intriguing absorption features associated with these excitons can be tuned by an applied voltage. Finally, Alexeev et al.6 found evidence that intralayer excitons can be mixed (hybridized) with interlayer excitons in molybdenum diselenide–tungsten disulfide heterobilayers, because the conduction band is delocalized over both layers (Fig. 1c). 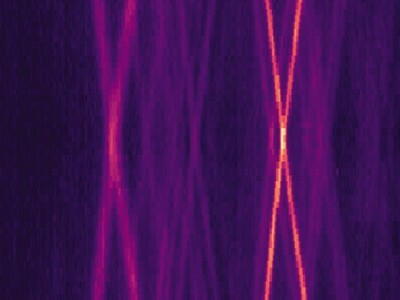 They showed that this feature amplifies the impact of the moiré potentials on optical properties. These hybridized states could combine the strong optical absorption of intralayer excitons with the tunability of interlayer excitons in electric fields — this tunability is attributable to the permanent electric dipole of interlayer excitons, which results from the electron and hole being in different layers. These studies and others10–12 give a first glimpse of the opportunities offered by combining two materials and changing the resulting optical properties simply through the twist angle. A challenge will be to control the natural tendency of two stacked monolayers to rotate after deposition towards an energetically favourable configuration, as has been observed for graphene–boron nitride heterobilayers13. This local rearrangement of atoms, termed reconstruction, can result in deviations from a completely periodic potential and therefore inhomogeneities in the moiré potentials14. Further insight into this issue could be gained by studying the differences that might occur between exfoliated heterobilayers and samples grown by a technique called chemical-vapour deposition15. In these four papers, an optical microscope with a spatial resolution of typically 1 micrometre was used to investigate moiré potentials that, by contrast, have a periodicity of only tens of nanometres. By using ‘near-field’ techniques that have a spatial resolution of the order of 10 nanometres, individual potentials could be addressed16. Depending on the size and depth of the moiré potentials, the number of trapped excitons could really go down to one, offering a source of single photons. 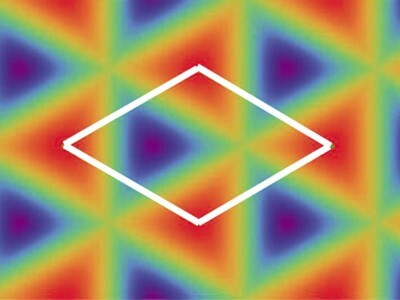 Finally, the potentials themselves could provide a periodic array of tunable light emitters — one of the many fascinating prospects for optics in two-dimensional ‘flatland’, although, admittedly, now the material is not completely flat, but two monolayers thick. Zhang, C. et al. Sci. Adv. 3, e1601459 (2017). Yu, H., Liu, G.-B., Tang, J., Xu, X. & Yao, W. Sci. Adv. 3, e1701696 (2017). Tran, K. et al. Nature 567, 71–75 (2019). Seyler, K. L. et al. Nature 567, 66–70 (2019). Jin, C. et al. Nature 567, 76–80 (2019). Alexeev, E. M. et al. Nature 567, 81–86 (2019). Cao, Y. et al. Nature 556, 43–50 (2018). Wang, G. et al. Rev. Mod. Phys. 90, 021001 (2018). Michler, P. et al. Science 290, 2282–2285 (2000). Zhang, N. et al. Nano Lett. 18, 7651–7657 (2018). Ciarrocchi, A. et al. Nature Photon. 13, 131–136 (2019). Paik, E. Y. et al. Preprint at https://arxiv.org/abs/1901.00598 (2019). Woods, C. R. et al. Nature Commun. 7, 10800 (2016). Alden, J. S. et al. Proc. Natl Acad. Sci. USA 110, 11256–11260 (2013). Hsu, W.-T. et al. Nature Commun. 9, 1356 (2018). Schmidt, P. et al. Nature Nanotechnol. 13, 1035–1041 (2018).